Son of a preacher. In 1903 he started a Theology study in Marburg, but in 1905 he moved to Berlin to study Medicine. In 1911 he joined the army, but in 1912 he left for health reasons. In the same year he attracted attention with "Morgue", an expressionistic collection of poems. In 1913 he dedicated "S�hne" to Else Lasker-Sch�ler, with whom he had an affair. At one time she called him a 'barbarian'. During the First World War he worked as a physician in Brussels. In 1917 he settled as dermatologist and venerologist in Berlin. In 1922 his first wife Edith Osterlohe died. She was seven years older than he and they had married at the beginning of the war. During the twenties he turned to writing essays. In 1929 his girlfriend, the actress Lili Breda, phoned him to say she was going to commit suicide. He rushed in his car to her house but she had jumped from the window and lay dead on the street when he arrived. In 1932 he was elected into the Prussian Academy of Arts and he remained a member after Adolf Hitler became Reichskanzler. By this time he conducted a liaison with the actress Tilly Wedekind and at the same time the actress Elinor B�ller-Klinkowstr�m was his mistress as well. Tilly would only find out in old age (and long after Benn's death) that she hadn't been the only one and Elinor never heard the truth. Initially Benn defended national socialism, believing that it would help Germany further. But soon he changed his opinion, allthough he became an army officer in Hanover in 1935 to earn a living. In 1938 he was forced to leave the Reichsschrifttumskammer and he was no longer allowed to publish his writings. In 1938 he dumped his two girlfriends and married his secretaty Herta von Wedemeyer. At the end of the war he was in Berlin and his wife, believing he was dead, committed suicide when the Russian army entered the village near the Oder where she was staying. He was devastated, but in 1946 he married the dentist Dr. Ilse Kaul, (1913-1995) who was 27 years his junior and continued his practice. In 1948 his "Statische Gedichte" was published in Switzerland. He was criticized by writers who returned from exile, but in his autobiography "Doppelleben" (1950, "Double Life") he defended himself. He died on the day he would receive the Art Prize of Nordrheinwestfalen. It was awarded to him posthumously on July 16, 1956. 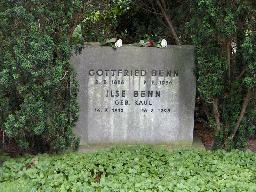 The grave of Gottfried Benn at the Waldfriedhof Dahlem, Berlin.  요청하신 페이지가 존재하지 않습니다.